*Report released January 17, 2017 due to Dr. Martin Luther King, Jr. Holiday. Fort Lauderdale, FL – The price of gas finally turned downward during the past week, according to the U.S. Energy Information Administration’s weekly price survey. The E.I.A. report shows the cost of regular unleaded notched 3¢ lower, on average, to settle at $2.36 per gallon. 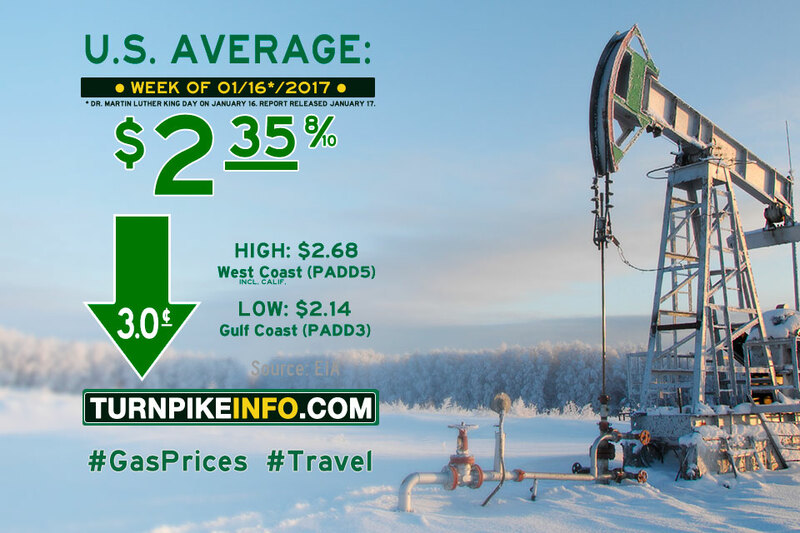 Regional prices across the West and Rocky Mountains, however, did not fall on the week, according to the E.I.A. All other regions enjoyed noticeable declines in fuel prices, with the volatile Midwest markets gaining the most: a 6¢ average price drop. The cost of diesel also gave ground this week, according to the E.I.A. Diesel prices went down just over a penny per gallon. The national average now stands at about $2.59 per gallon.